Posted October 21st, 2012 by Gerry La Rocca & filed under Accounting Careers, Financial Statement Analysis, International Accounting, IPO. A little while back facebook’s IPO (Initial Public Offering) would take the financial community by storm. The stock would certainly rise to double its Initial Public Offering. This is the reason investors crave to have the opportunity to purchase an IPO. After four months of paperwork, hype and speculation, the last piece of the Facebook IPO is in place: Facebook priced its IPO at $38 a share. At that price, Facebook’s IPO will raise $16 billion, making it the largest tech IPO in history. It’s the third largest U.S. IPO ever, trailing only the $19.7 billion raised by Visa (V, Fortune 500) in March 2008 and the $18.1 billion raised by automaker General Motors (GM, Fortune 500) in November 2010, according to rankings by Thomson Reuters. The $38 IPO price is the rate at which Facebook’s underwriters (including lead banker Morgan Stanley) will sell shares to their clients, which typically include large institutional investors, mutual funds and hedge funds. What does the founder stand to make on this deal? 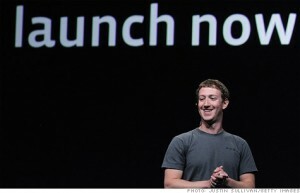 Who’s selling shares: Facebook CEO and founder Mark Zuckerberg plans to sell 30.2 million shares in the IPO offering. That will net Zuckerberg about $1.1 billion. What is the stock selling at today? In early September 2012, with Facebook’s stock down by more than 50% since its IPO, the world’s biggest social networking company moved to shore up its stock price. Mark Zuckerberg, Facebook’s CEO, conducted his first public interview since the debacle. He also promised he wouldn’t sell any of his personal shares for one year and the company said it would withhold 101 million shares. But the rebound in Facebook’s stock that the company tried to engineer appears to be over for now. Facebook’s shares changed hands on Thursday for less than $19 and the stock closed around $18.99, 50% lower than Facebook’s IPO price of $38. One of the reasons why the stock dropped! Ironically, it was one of Facebook’s biggest competitors that caused Facebook’s stock to drop by more than 4.5% on Thursday. Google mistakenly released disappointing quarterly earnings during the trading day, fueling general investor concern over online advertising sales and the shift to mobile. Stock Options may not be in the money! Facebook will itself report earnings on Tuesday. So far the leading tech indicators are not good with Google, Intel and IBM all reporting weak earnings. Halloween might truly get scary for Facebook’s stock as lock-up restrictions on many millions of Facebook shares owned by Facebook employees expire the following Monday. Facebook’s shares first traded 50% lower than their IPO price in August. Now, five months after the IPO, they are back below this symbolic threshold. Shares in Facebook hit new market lows in Friday trading in New York , leaving them at half their original flotation value. The stock closed down 4.1% at $19.05 and fell to $19 for the first time, meaning it has lost half its market value since the company’s initial public offering in May 2012. Investors have been concerned about Facebook’s ability to increase revenue and make money from its growing mobile audience, although many analysts still hold positive opinions of the company’s long-term prospects. Following the social media network’s notorious initial public offering (IPO) in May, the lock-up period that forced pre-float investors to keep hold of shares ended on Thursday, suddenly placing millions of shares on the market. When Facebook went public three months ago, 421 million shares were issued at $38 (£24.20) each, rising as high as $45 (£28.66) each after trading began. But the stock closed on its first day barely above its initial public offering price of $38 and has been below that level since. Analysts are now questioning the moves shareholders, including Goldman Sachs (NYSE: GS – news) and Microsoft (NasdaqGS: MSFT – news) , will make – testing their long-term investment commitments to the social networking site. Currently companies only have the ability to advertise products or brands to users who have ‘liked’ their pages. Facebook is believed to be testing the scheme which, if successful, would open advertisers up to the site’s one billion users, who have not necessarily become fans of particular brand pages. Paul Armstrong, head of social at media agency Mindshare UK said: “Facebook have to walk a fine line now as they have to keep both stakeholders and users happy. “Mark Zuckerberg has a colourful past with user privacy and has a clear vision for a more open future web for all. 1. After reading this article did you ever expect the stock of facebook to decline by more than half its initial public offering? 2. Based on the new privacy laws and customer concerns over their personal lives being exploited, will facebook continue to grow at its unprecedented rate? 3. Based on your experience and usage of facebook: Will the company’s advertising revenues continue to grow?